What is your favorite firming mask? 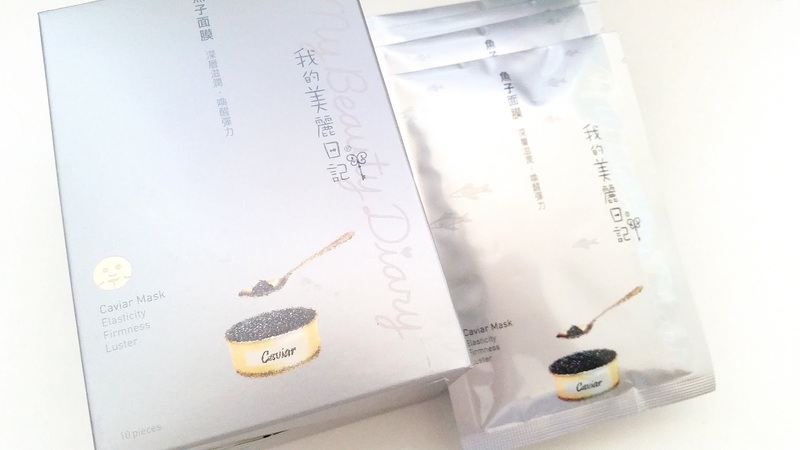 One of my favorite firming masks is this My Beauty Diary Caviar Mask. My daughter and I picked up these about 5 months ago when 99 Ranch (an Asian supermarket) had a huge sale on My Beauty Dairy (MBD) masks. If I remember correctly, they were just 8 or 9 dollars a box. Crazy right? We stocked up on MBD masks and got around to try a couple of new ones too. These Caviar masks were one of those masks that we restocked on mainly because I like them so much. My first MBD caviar mask was from my daughter's mask stash and I liked it at once. She ended up giving me the rest of her box because I loved them that much. Since then, I have stocked up on them multiple times and they are a staple in my mask stash. 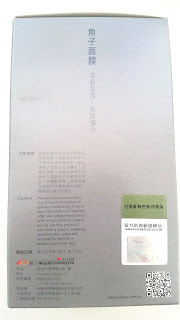 Product Description: Fight against aging with the My beauty Diary Caviar Masks. 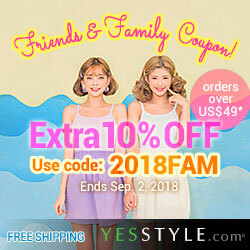 These masks promises to restore vitality and youthful appearances. The Caviar sheet masks uses sturgeon caviar essence that has been specially extracted to contain ingredients designed to provide moisture while firming the skin. The masks adds elasticity and luster to the skin, providing you with the appearance of youthful skin. The sheet masks are formulated with hydrolyzed elastin to lift and firm the skin while repairing damages that has been done over time. To Use: Cleanse and tone the face first. Remove the mask from the its packaging and remove the protective layer. Apply the sheet mask onto the face and leave it on for 20 to 30 minutes. 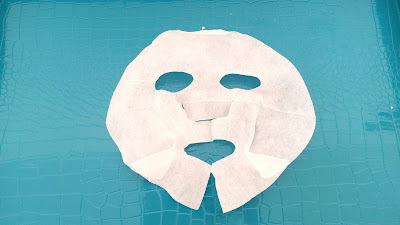 Remove the sheet mask and pat in any remaining essence. Continue with the rest of your skincare routine. 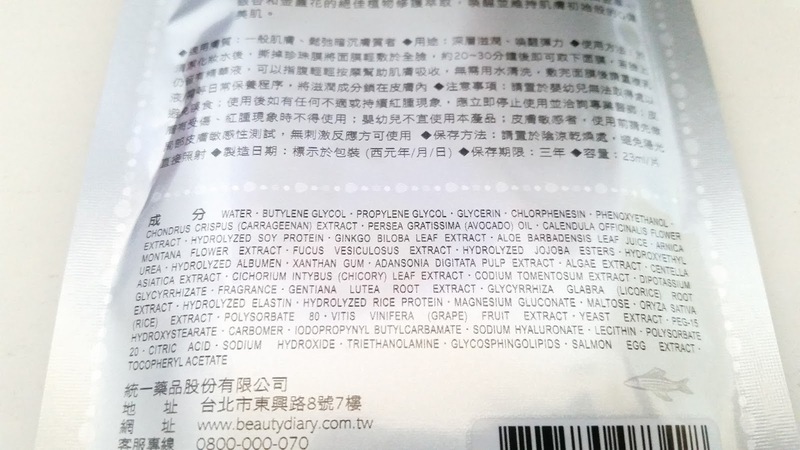 Ingredients: Water, butylene glycol, propylene glycol, glycerin, chlorphenesin, phenoxyethanol, chondrus crispus (carrageenan) extract, persea gratissima (avocado) oil, calendula officinalis flower extract, hydrolyzed soy protein, gingko biloba leaf extract, aloe barbadensis leaf juice, arnica montana flower extract, fucus vesiculosus extract, hydrolyzed jojoba esters, hydroxyethyl urea, hydrolyzed albumen, xanthan gum, adansonia digitata plup extract, algae extract, centella asiatica extract, cichorium intybus (chicory) leaf extract, codium tomentosum extract, dipotassium glycyrrhizate, fragrance, gentiana lutea root extract, glycyrrhiza glabra (licorice) root extract, hydrolyzed elastin, hydrolyzed rice protein, magnesium gluconate, maltose, oryza sativa (rice) extract, polysorbate 80, vitis vinifera (grape) fruit extract, yeast extract, PEG-15 hydroxystearate, carbomer, iodopropynyl butylcarbamate, sodium hyaluronate, lecithin, polysorbate 20, citric acid, sodium hydroxide, triethanolamine, glycosphingolipids, salmon egg extract, tocopheryl acetate. 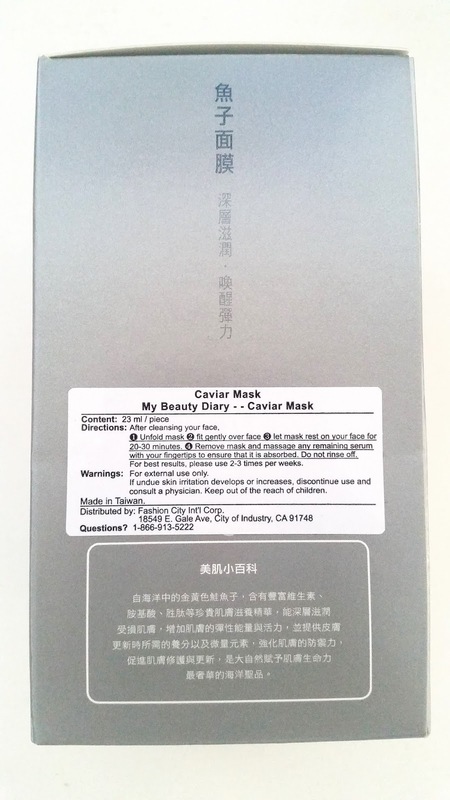 Packaging: My Beauty Diary Caviar Mask's packaging is simple. The silver color adds an elegant feel to the masks. 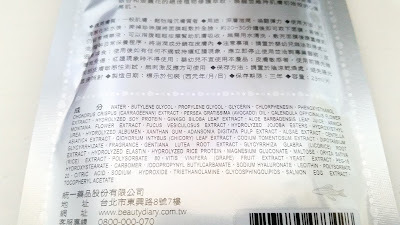 The masks comes with plenty of information and the ingredient list as well. The box packaging also comes with a security scratch-off sticker which can be used to verify the authenticity of the masks. Scent: I remember when I first tried the My Beauty Diary Caviar Mask and thought there would be a caviar scent. However, much to my surprise, the sheet masks smells like a mix of floral and aloe scents. Totally unexpected but I like it. The scent is light, fresh, and sweet. The scent adds to the relaxing feel of mask time and makes me want to mask forever. Texture: The essence is a thin liquid. Similar to an essence or a liquidy serum. The mask sheet feels soft and it adheres to the face easily. Helen's Thoughts: Before I get to why I love this mask so much, I just want to share the mask's one downside. It is a personal one and it might not apply to everyone, but I am sure I am not the only one in this boat. The one downside for me is the fit of this mask. The cut is a bit awkward for my face type and I always have to adjust the mask to make it fit better. By adjusting, I mean ripping off pieces here and there to apply it elsewhere on my face. This happens with quite a lot of masks and I've just come to accept the fact that a lot of my favorite masks don't fit 100% perfectly on my face. However, one day, I wish to find a mask that I love and fits 100% perfectly on my face. I would buy that mask forever and ever. Okay, now that we got that out of the way, let's talk about why I love this mask so much. Aging is inevitable at my age, so I have been drawn towards products that can combat aging. This mask promises to provide elasticity, luster, and firm up the skin while moisturizing it. It sounds like the perfect combo and it does just that. I can tell my face feels moisturized and firm after each use. My face would feel plump and soft to the touch. The mask gives a lifting effect too. It is not overly noticeable the first few times but it gets more and more noticeable after a few uses. I do not use this mask everyday. I usually use it about one or two times a week. The mask's effects last about one to two days for me. I also use other masks like hydrating masks or soothing masks or nourishing masks, etc. in between to keep my skin nice and moisturized. This is not my only favorite anti-aging mask but it is one of the cheaper ones. So, I do not feel bad if I choose to use it more often. The other side of the box contains directions and some information regarding the masks. Final Thoughts: It is pretty clear this My Beauty Diary Caviar mask is a winner in my books. Aside from the imperfect fit, which is a small set back, everything else is great. I love how the mask moisturizes, firms, adds elasticity and luster to my skin. It is also inexpensive, so I can stock up without feeling guilty. Would I repurchase this in the future? Yes. 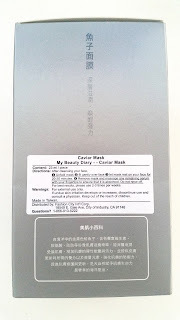 It is a winner for me and as long as My Beauty Diary (MBD) doesn't change its formula or anything I will keep buying it. Do I think this mask is worth a try? Yes. For those who want a quick and inexpensive product to fight against aging, this mask is it.